Bright White Clearcoat 2019 Ram 1500 Classic Tradesman RWD 8-Speed Automatic 3.6L V6 24V VVT 17" x 7" Aluminum Wheels, Black Exterior Mirrors, Body Color Upper Fascia, Bright Front Bumper, Bright Grille, Bright Rear Bumper, Chrome Appearance Group, Exterior Mirrors w/Heating Element, Power & Remote Entry Group, Power Heated Fold-Away Mirrors, Power Locks, Power Windows w/Front 1-Touch Down, Premium Vinyl Door Trim w/Map Pocket, Quick Order Package 22B Tradesman, Remote Keyless Entry w/All-Secure, Tradesman Package. Thys Price includes our discount and common incentives that most customers can qualify for. In some cases, not all incentives will apply to all customers. In other cases, there may be additional incentives to improve the price. See dealer for details. New Price! Flame Red Clearcoat 2019 Ram ProMaster 1500 136 WB FWD 6-Speed Automatic 3.6L 6-Cylinder 16" Wheel Covers, Cargo Net, Driver 6-Way Adjustable Lumbar Seat, Interior Convenience Group, Locking Glove Box, MOPAR Cargo Area LED Lighting, Power Folding/Heated Mirrors, Quick Order Package 21A, Shelf Above Roof Trim, Underseat Storage Tray. Thys Price includes our discount and common incentives that most customers can qualify for. In some cases, not all incentives will apply to all customers. In other cases, there may be additional incentives to improve the price. See dealer for details. Bright White Clearcoat 2019 Ram ProMaster 1500 136 WB FWD 6-Speed Automatic 3.6L 6-Cylinder, Cargo Partition with Sliding Window, ParkSense Rear Park Assist, Speed Control, MOPAR Cargo Area Lighting, 12V Rear Power Outlet, Power Folding Heated Mirrors, Interior Convenience Group, Locking Glove Box, Quick Order Package 21A, Shelf Above Roof Trim, Underseat Storage Tray. Thys Price includes our discount and common incentives that most customers can qualify for. In some cases, not all incentives will apply to all customers. In other cases, there may be additional incentives to improve the price. See dealer for details. Flame Red Clearcoat 2019 Ram 1500 Big Horn/Lone Star 4WD 8-Speed Automatic 3.6L V6 24V VVT Quick Order Package 23Z Big Horn/Lone Star, Remote Start System, Steering Wheel Mounted Audio Controls. Thys Price includes our discount and common incentives that most customers can qualify for. In some cases, not all incentives will apply to all customers. In other cases, there may be additional incentives to improve the price. See dealer for details. Recent Arrival! Brand New Ram 1500 Tradesman Quad Cab 4x4 with extras like the 5.7L V8 HEMI, Trailer Brake Control, Tradesman Level 1, Tradesman Group and Chrome Appearance Group. Bright White. Brand New Crystal Metallic 2019 Ram 1500 Big Horn 4WD with the HEMI 5.7L V8, Upgraded Level 2 Equipment, Front and Rear Rubber Floor Mats, Deluxe Cloth Bucket Seat, Rear Wheelhouse Liners, 20 inch wheels, Remote Start, and Parksense Park Assist. Thys Price includes our discount and common incentives that most customers can qualify for. In some cases, not all incentives will apply to all customers. In other cases, there may be additional incentives to improve the price. See dealer for details. Recent Arrival! Red 2018 Ram 2500 Tradesman 4WD 6-Speed Automatic 6.4L Heavy Duty V8 HEMI w/MDS 1-Yr SiriusXM Radio Service, 5.0" Touchscreen Display, Anti-Spin Differential Rear Axle, Black Exterior Mirrors, Black Wheel Flares, Bright Front Bumper, Bright Grille, Bright Rear Bumper, Carpet Floor Covering, Charge Only Remote USB Port, Chrome Appearance Group, Clearance Lamps, Exterior Mirrors Courtesy Lamps, Exterior Mirrors w/Heating Element, Exterior Mirrors w/Supplemental Signals, Front & Rear Floor Mats, Front Armrest w/Cupholders, Front Performance Tuned Shock Absorbers, GPS Antenna Input, I/P Mounted Auxiliary Switches, Integrated Voice Command w/Bluetooth, Media Hub (USB, AUX), Off Road Package, Offroad Decal, Overhead Console, Popular Equipment Group, Power Black Trailer Tow Mirrors, Quick Order Package 22A Tradesman, Radio: Uconnect 3 w/5" Display, Rear Performance Tuned Shock Absorbers, Rear View Day/Night Mirror, Remote Keyless Entry, SiriusXM Satellite Radio, Snow Chief Group, Temperature & Compass Gauge, Tow Hooks, Trailer Tow Mirrors, Wheels: 18" x 8.0" Steel Chrome Clad. Trailer Brake Control and more. Thys Price includes our discount and common incentives that most customers can qualify for. In some cases, not all incentives will apply to all customers. In other cases, there may be additional incentives to improve the price. See dealer for details. Recent Arrival! Bright White Clearcoat 2018 Ram 2500 Tradesman 4WD 6-Speed Automatic 6.4L Heavy Duty V8 HEMI w/MDS 4D Crew Cab, 6.4L Heavy Duty V8 HEMI w/MDS, 1-Yr SiriusXM Radio Service, Anti-Spin Differential Rear Axle, Bright Front Bumper, Bright Grille, Bright Rear Bumper, Carpet Floor Covering, Chrome Appearance Group, Clearance Lamps, Electric Shift-On-The-Fly Transfer Case, Exterior Mirrors w/Heating Element, For More Info, Call 800-643-2112, Front & Rear Floor Mats, Front Armrest w/Cupholders, I/P Mounted Auxiliary Switches, Locking Tailgate, ParkSense Rear Park Assist System, Popular Equipment Group, Protection Group, Quick Order Package 22A Tradesman, Remote Keyless Entry, SiriusXM Satellite Radio, Snow Chief Group, Spray In Bedliner, Storage Tray, Trailer Tow Mirrors, Wheels: 18" x 8.0" Steel Chrome Clad. Thys Price includes our discount and common incentives that most customers can qualify for. In some cases, not all incentives will apply to all customers. In other cases, there may be additional incentives to improve the price. See dealer for details. NEW 2018 Ram 2500 Tradesman 4WD with the 6-Speed Automatic Cummins 6.7L I6 Turbodiesel Cummins 6.7L I6 Turbodiesel, 4WD, 5.0" Touchscreen Display, Anti-Spin Differential Rear Axle, Black Exterior Mirrors, Black Wheel Flares, Bright Grille, Carpet Floor Covering, Charge Only Remote USB Port, Chrome Appearance Group, For More Info, Call 800-643-2112, Front & Rear Floor Mats, Integrated Voice Command w/Bluetooth, Off Road Package, Offroad Decal, Overhead Console, Popular Equipment Group, Power Black Trailer Tow Mirrors, Quick Order Package 2FA Tradesman, Radio: Uconnect 3 w/5" Display, Rear View Day/Night Mirror, Remote Keyless Entry, SiriusXM Satellite Radio, Temperature & Compass Gauge, Trailer Brake Control, Trailer Tow Mirrors, Wheels: 18" x 8.0" Steel Chrome Clad. Thys Price includes our discount and common incentives that most customers can qualify for. In some cases, not all incentives will apply to all customers. In other cases, there may be additional incentives to improve the price. See dealer for details. Recent Arrival! Brilliant Black Crystal Pearlcoat 2018 Ram 2500 Tradesman 4WD 6-Speed Automatic Cummins 6.7L I6 Turbodiesel with Black Exterior Mirrors, Bright Front Bumper, Bright Grille, Bright Rear Bumper, Chrome Appearance Group, Chrome Tubular Side Steps, Clearance Lamps, Exterior Mirrors Courtesy Lamps, Exterior Mirrors w/Heating Element, Exterior Mirrors w/Supplemental Signals, Front & Rear Floor Mats, I/P Mounted Auxiliary Switches, LED Bed Lighting, Popular Equipment Group, Power Black Trailer Tow Mirrors, Quick Order Package 2FA Tradesman, Remote Keyless Entry, SiriusXM Satellite Radio, Trailer Tow Mirrors, Wheels: Thys Price includes our discount and common incentives that most customers can qualify for. In some cases, not all incentives will apply to all customers. In other cases, there may be additional incentives to improve the price. See dealer for details. Crystal Metallic 2018 Ram 2500 Tradesman 4WD 6-Speed Automatic Cummins 6.7L I6 Turbodiesel Anti-Spin Differential Rear Axle, Bright Grille, Carpet Floor Covering, Chrome Appearance Group, Clearance Lamps, Cold Weather Group, Electric Shift-On-The-Fly Transfer Case, Engine Block Heater, Front & Rear Floor Mats, I/P Mounted Auxiliary Switches, Integrated Voice Command w/Bluetooth, Media Hub (USB, AUX), Overhead Console, ParkSense Rear Park Assist System, Popular Equipment Group, Protection Group, Quick Order Package 2FA Tradesman, Radio: Uconnect 3 w/5" Display, Rear View Day/Night Mirror, Remote Keyless Entry, SiriusXM Satellite Radio, Snow Chief Group, Temperature & Compass Gauge, Trailer Brake Control, Winter Front Grille Cover. Thys Price includes our discount and common incentives that most customers can qualify for. In some cases, not all incentives will apply to all customers. In other cases, there may be additional incentives to improve the price. See dealer for details. Flame Red Clearcoat 2019 Ram 1500 Sport/Rebel 4WD 8-Speed Automatic HEMI 5.7L V8 Multi Displacement VVT 1500 Sport/Rebel, 4D Crew Cab, 4 Adjustable Cargo Tie-Down Hooks, 8.4" Touchscreen, Auto-Dimming Rear-View Mirror, Bed Utility Group, Door Trim Panel Foam Bottle Insert, Front Heated Seats, Heated Steering Wheel, Integrated Centre Stack Radio, LED Bed Lighting, Level 1 Equipment Group, Power Adjustable Pedals, Radio: Uconnect 4 w/8.4" Display, Rear Window Defroster, Single-Disc Remote CD Player, Sun Visors w/Illuminated Vanity Mirrors, Universal Garage Door Opener. Thys Price includes our discount and common incentives that many customers can qualify for. In some cases, not all incentives will apply to all customers. In other cases, there may be additional incentives to improve the price. See dealer for details. Brand New Delmonico Red Ram 1500 Laramie Crew Cab 4x4. All of the excellent Laramie features plus...5.7L HEMI, Sport Appearance Group, Bed Utility Group, Uconnect 12.0 with Navigation, Laramie Level 1 Equipment Group, Anti Spin Differential Rear Axle, and Trailer Brake Control. ***While every reasonable effort is made to ensure the accuracy of this data, we are not responsible for any errors or omissions contained on these pages. Please verify any information in question with a dealership sales representative. The advertised price does not include sales tax, vehicle registration fees, other fees required by law, finance charges and any documentation charges. New vehicle special pricing may include our own discount along with factory incentives. Please check with your sales associate to make sure you qualify. 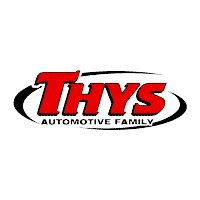 Thys Automotive Family	41.9862218, -92.5848321.